Sometimes I have to blog about things so that I’ll remember them in the future, and this weekend was so chock full of good stuff that a blog entry is definitely in order. 2012 is shaping up to be a fantastic year, mostly because of our commitment to reading through the Bible this year using the Daily Walk Bible. Did I mention that Dayne decided to do it with me? 😀 When I bought my Bible, I ordered two more – one for Dana and one for whoever else decided to do it. None of my girlfriends volunteered, and Dayne asked if I wanted him to join me. It has been one of the better experiences in our marriage so far. We often talk about the things we’re reading – things that stood out to us that are just plain cool, questions that were raised during our readings, and we sometimes process the devotionals/applications together. It’s so nice to have a casual, regular way to talk about God and our individual walks in faith. Not only that, it is just so incredibly refreshing and exciting to be in the Word and growing closer to the heart of God everyday. I’m finding that Genesis, so far, reads like a novel, where I can’t wait to see what happens next to Adam & Eve, Noah, Abraham & Sarah, and Isaac & Rebekah. For the first time for me, these stories have fit together like a puzzle where I can see God walking alongside each person and continuously acting in their lives. It reinforces for me the truth that God never changes; He has been the same all along (“…the Father of the heavenly lights… does not change like shifting shadows.” [James 1:17]). He walked so intimately with His people, and it is a challenge for me to accept that He still wants to walk that intimately with us today, that we need to orient ourselves toward Him, “fix our eyes” on Him (2 Cor. 4:18, Heb. 12:2) and try to “keep in step” with Him in obedience (Gal. 5:25). José, one of Dayne’s friends from work, let us borrow the New Super Mario Bros. for Wii, so Dayne & I have been playing that at random times together. Dayne (or should I say “Mario”) gets upset with me (or should I say “Luigi”) because I lose a lot of lives, but it’s really nice to have a co-op game we can play together (and surely “Luigi” will get better). We played that sporadically throughout the weekend, and it was fun! On Saturday, Dayne got up super early to go to our new church’s Men’s Bible Study. They meet at Cracker Barrel so there’s some breakfast incentive. 🙂 I was so proud of him for getting up and going! I thought I would sleep through it (since it’s at 7:30), but I got up when Dayne was getting ready and had some delicious quiet time eating breakfast, reading my Bible, cleaning up around the house, and starting The Meaning of Marriage by Tim Keller. It sounds like Dayne’s gonna keep going on Saturdays, and I think that’s wonderful for both of us. Saturday was such a gorgeous day, and it was our first completely free day in a while, so we took it upon ourselves to go to the Brandywine Zoo. 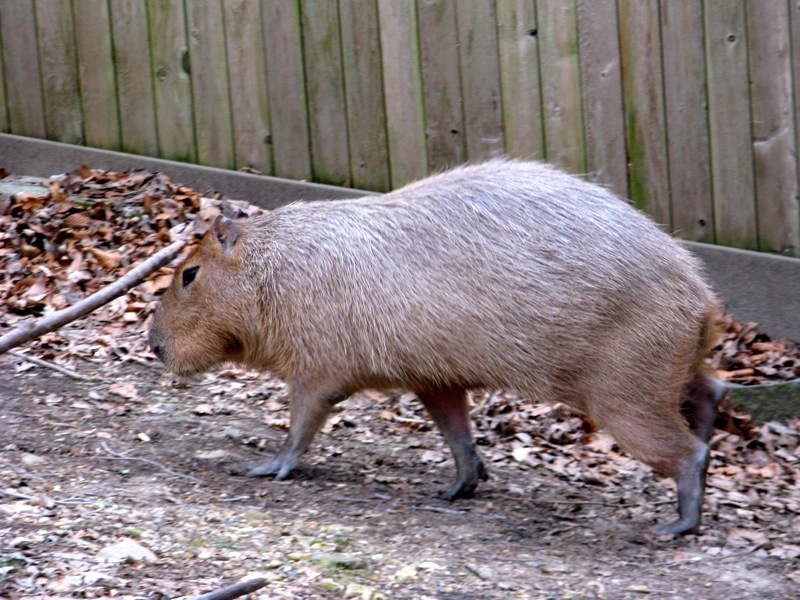 The zoo's capybara, before he got upset and squeaked and went inside his house. 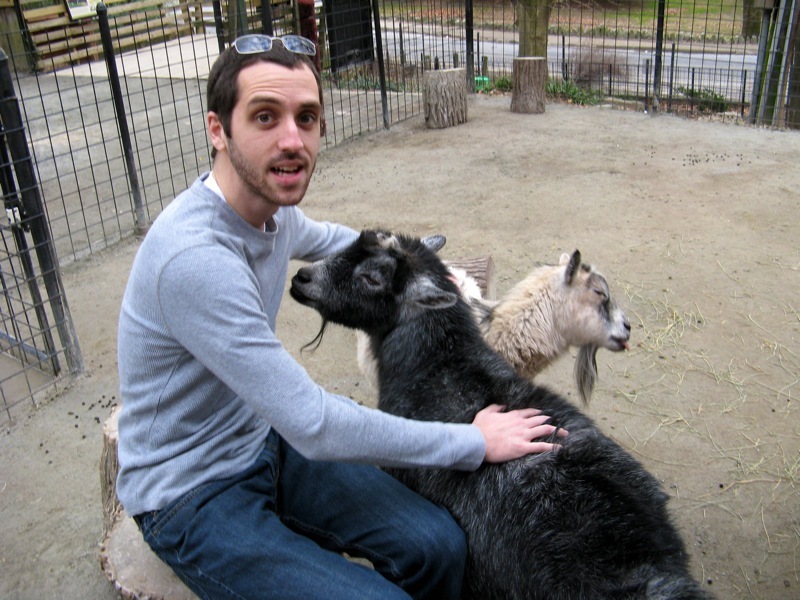 Dayne petting the pgymy goats... they were all OVER him! After the zoo, which was free that day (awesome! ), we spontaneously decided to go to ChaddsFord Winery. Dayne has become a wine fan since marrying me, which was exactly what was supposed to happen. 😉 We took a self-guided tour, and instead of doing a tasting on empty stomachs, we picked out a few kinds of wine to take home and try. I’m especially excited about the Spiced Apple Wine, which you can heat on the stove with cinnamon sticks and spices to make hot mulled apple wine. Cozy and yum! On our way home, we stopped at Arby’s for Jamocha shakes (delicious!). We ended up going out to dinner that night at Chili’s (with a gift card! ), which was nice since we haven’t gone out on a dinner date in a while, either. On Sunday, we got up and went to our church. I am so in love with this church and so thankful that God has so obviously led us there. Connection (small) groups are starting back up for the new year, so we signed up to get more information on a Financial Peace University class and a Marriage study. 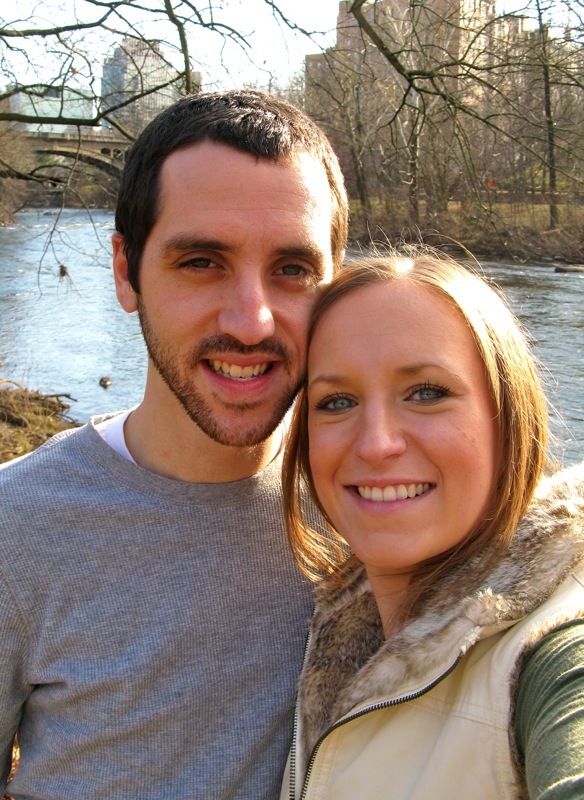 The young couples’ group is also starting back up this week (! ), so we’re going to that tomorrow night and I.cannot.wait. The sermon series is currently on Ezekiel and being fearless… since fear and anxiety are things I struggle with, I’m thankful to be focusing on them early in the New Year. It’s exciting to feel what God is doing in my heart, see what God is doing with my husband & me, and to also be a part of what God’s doing in our church. After church, we mustered up our courage to try another meal in the Crockpot (after our first failure which I was too embarrassed and disappointed to write about). I was intrigued by this blog earlier this year, and then I got the author’s actual cookbook for Christmas this year from my brother: MORE Make it Fast, Cook it Slow. We threw in the ingredients for a Ground Beef Layered Casserole and crossed our fingers! Finally, last night Dayne and I ate our casserole and watched a documentary on Netflix. I’m quite happy to start a new week with such a relaxing, rejuvenating weekend behind me! What are your favorite things to do on free weekends? Categories: Bible Study, Books, Cooking & Baking, Dayne, Fun with Friends, Kids & Nannying, Photos | Tags: Bible, brandywine zoo, capybara, casserole, chaddsford winery, church, crockpot, Daily Walk Bible, Dayne, faith, God, life, make it fast cook it slow, marriage, Old Testament, pgymy goats, Stephanie O'Dea, super mario bros., The Meaning of Marriage, Tim Keller, weekend, wine, zoo | Permalink.